It's Official: Canada's Tallest Building is Under Construction - Constantine Enterprises Inc.
It’s tough scheduling ground breaking ceremonies for the day that ground is actually broken on a development, so today, what has been evident to us for weeks now was made official (and made more public) as Sam Mizrahi, President of Mizrahi Developments, stood upon a podium erected on the site of The One and declared it was full-steam-ahead for the skyscraping new complex. 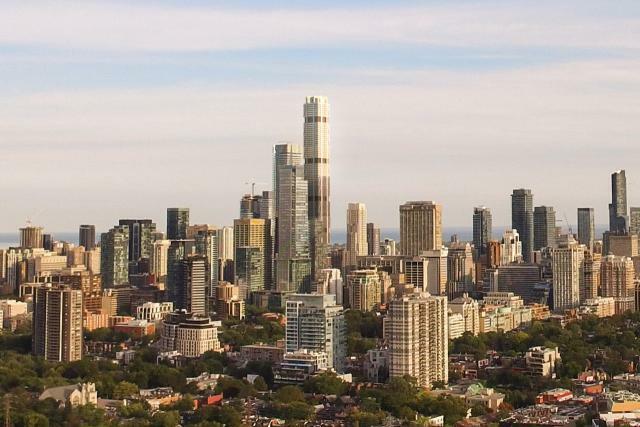 Mizrahi spoke about his intentions for the property; to create something worthy of the important location, to create something that adds to the public realm in several ways, to create something that Torontonians will be proud of. And Mizrahi, who talked about the hard work to put it all together, also underlined that planning The One has been “fun”. Invited to the podium as well was Toronto Mayor John Tory, fresh off a defeat at City Council where he recommended renaming a stadium after a disgraced former mayor. 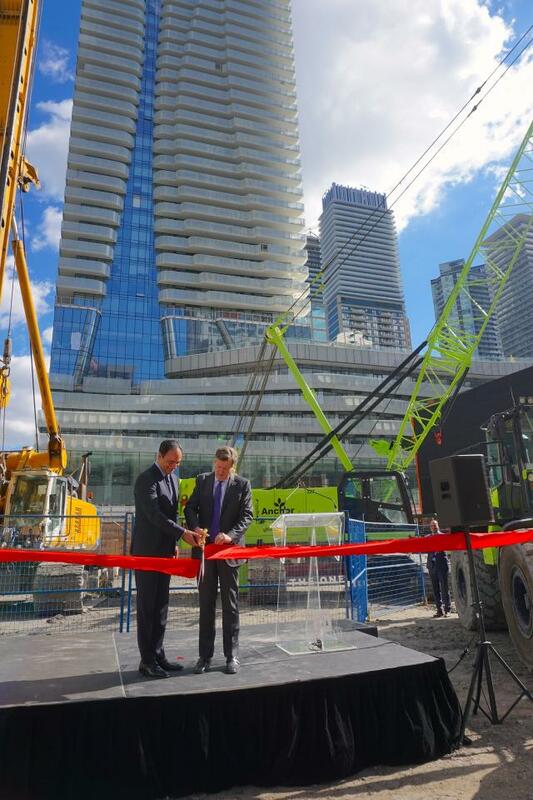 Tory spoke of Toronto’s growing importance on the global scene, reminding the crowd that Toronto is frequently cited as one of the best cities in the world in which to live, and commented that the ambition for this building reflected the increased confidence that Torontonians have in their own city. There have been a few changes to plans for the Foster + Partners and Core Architects-designed building since our last story. 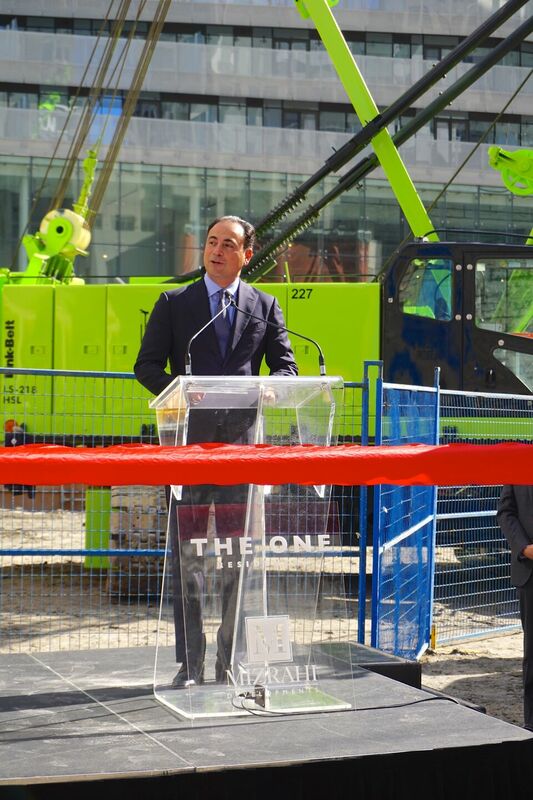 The podium of The One has been reduced to five storeys with three of them for retail and two for restaurants. With 33 foot ceilings, the retail space at the corner will be the height of two storeys, with a 8,500 square foot ground floor uninterrupted by columns, while the room itself will feature eight dramatically canted columns reaching to the ceiling above. The sixth level will house a sky lobby for hotel guests (the next 11 floors) and for residents of condominium suites in the remainder of the tower. The top of the podium will feature a landscaped amenity terrace with pool for residents. At ground level, wide, landscaped sidewalks and a recessed entrance to the building on Bloor will allow for enough space that pedestrians will not feel crowded, while at the back of the building, the entry area to the garage is going to feature a living wall, softening the laneway and creating a high quality space for those arriving by car. 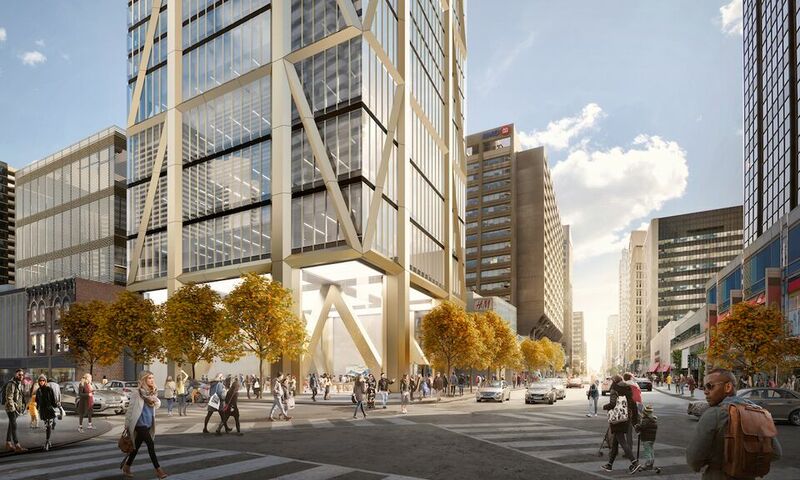 Higher up, the building’s triangular exposed frame—a light champagne colour—will be highlighted by inset LEDs, allowing the 306.3 metre-tall building to glow by night. Capable of producing any colour, the building’s lights will be able to set a mood as desired. 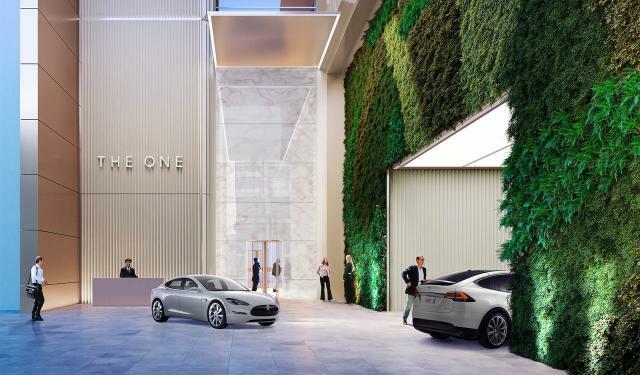 More details renderings of The One can be found in our database file for the project, linked below. You can get in on the conversation by visiting one of associated Forum threads, or leave a comment in the space provided on the page.